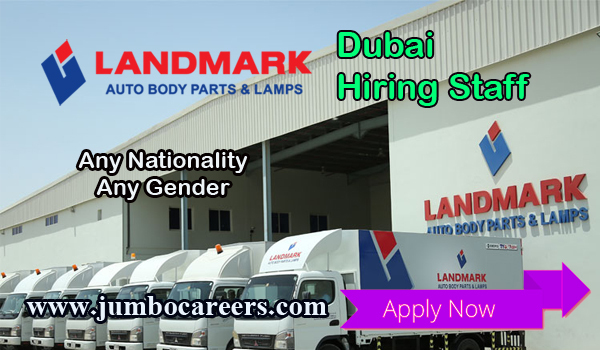 Leading automobile sparts company in Dubai- Landmark Autos is urgently hiring experienced staff for various positions. About the Company : Landmark International Auto Spare Parts is a company based in the United Arab Emirates. We are celebrating our successful decade of operation in 2018. We are the leading Auto Lamps, Body Parts and Cooling Parts Importer and exporter in the Middle East, Asia,Russia, CIS and Africa. Landmark employs more than 130 hard workers across multiple facilities in the country. Possessing a skilled and service oriented workforce which benefits from our assessment & training programs led by a strong leadership and manpower development team. Embedded with our organization is pure focus on Teamwork, customer service and commitment to quality are our core values.